Last year I wrote a piece on Tips and Tricks for Downhill Skiing with Kids, which is my most comprehensive guide to date on the subject of family resort skiing. I wanted to follow up on this popular story with more tips and tricks, this time focusing on making learning to ski FUN. Learning to ski should be fun, and you shouldn't have to bribe the kids to get them to the ski hill. However, falling isn't a ton of fun (and beginners will fall a lot.) Learning any new sport can also be very challenging at times, and we all benefit from receiving a reward or two for hard work and effort. Take the kids tubing, sledding or ice skating in the afternoon if they keep up a good attitude in the morning and try hard on the hill. We like to ski at Nakiska Ski Area near Calgary, where there is a tube park conveniently located next to the beginner's area. (And I'm pretty sure they chose the location on purpose.) We also like to go over to the Village where there is a skating pond and a sledding hill beside the Delta Lodge. Struggling with a child who doesn't want to take ski lessons? Make your child/children a deal that you'll take them on a weekend ski trip to a resort they'd like to visit if they agree to take at least one refresher lesson to launch the new ski season. Reward hard work on the hill and positive attitudes with hot chocolate and treats in the day lodge at the end of the day. And it doesn't have to be a big deal or cost a lot. It can be as simple as "Mommy thinks you did really well today and I loved your positive attitude, even when I know it wasn't always easy. Let's go get a hot chocolate and a cookie in the lodge." My son and I are going to try something new this winter, and we're going to learn to improve our skiing together! As in "in the same class, together." 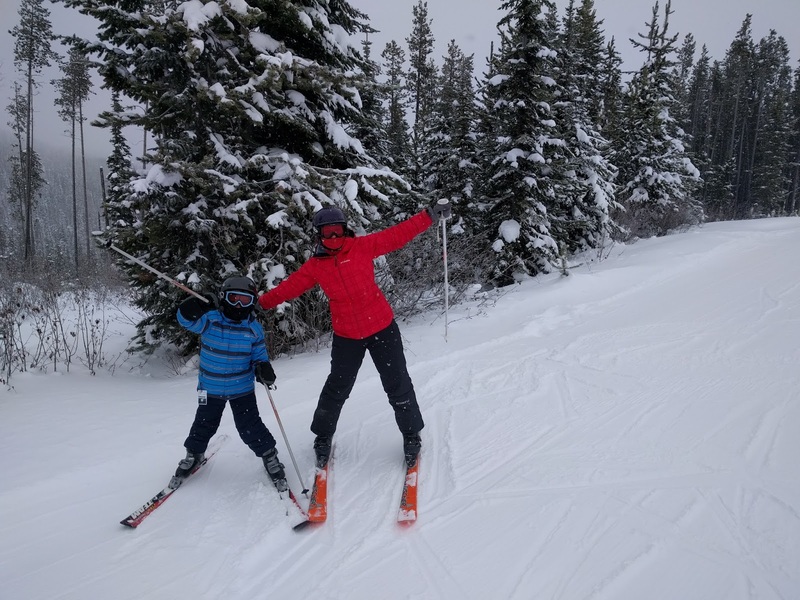 Nakiska Ski Area offers Family Coaching Clinics as part of their signature lessons, and it's a great way for families to learn to ski together. Children must be 5 years of age or older, and everybody should be at a similar ability. The Family classes are ideal for siblings who can ski the same runs and want to take lessons together, or for a whole family who wants to learn to ski together rather than in separate classes. My son and I have similar abilities on the ski hill and I know we'll benefit from taking a class together. And this way, I'll know what he learned in his class so I can continue coaching him after the class is finished. Otherwise, how do you continue to work on the skills that the kids learned in their class? In a family coaching clinic, you can even just feel comfortable tagging along in the lesson (even if the focus is on the kids) just so that you're in the loop and know how to proceed after the class is finished. Learning to ski together can be fun! My son LOVES skiing at Fernie Alpine Resort and at Kimberley Alpine Resort in neighboring BC because of the kids' tree runs. 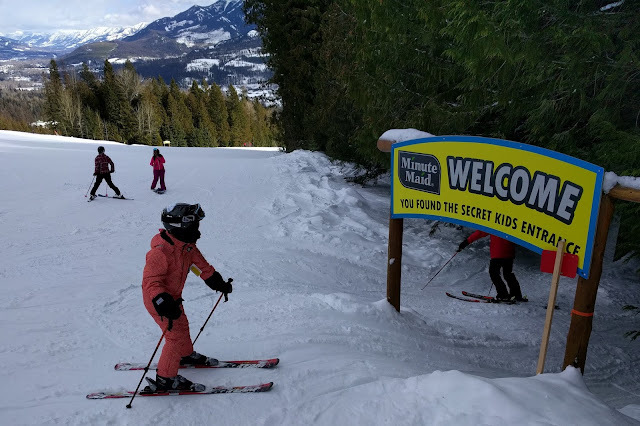 The Minute Maid Kids' Trails are located on the bottom half of the resorts, and are a huge hut with all pint sized skiers. The special kids' trails wind and twist their ways through the trees (along narrow paths that only small skis will fit) and they are conveniently located off of well groomed beginner runs for easy access. At Nakiska, my son loves skiing in the glades where there are wide runs through well-spaced trees. It's a great place to get a safe intro to backcountry skiing. The more you ski, the better you'll ski. The better you ski, the more fun you'll have. And save money with discount cards! Kids love games, and ski games would be no different. Create a family fun scavenger hunt for the ski hill, play games of follow the leader, or take turns choosing which runs or route to take on your way down the hill. And trust me, I have learned this one the hard way. Skip that important snack by even fifteen minutes, and it may take some kids half an hour (or longer) to recover even after they've had a snack. And a tip for eating on chair lifts - make sure the snack can be eaten with gloves ON. Most things are more fun with friends, and skiing is no different. Round up a gang of families with kids who can ski the same runs, and head out for a fun day on the slopes together. And one advantage to skiing with other families, is that you can divide kids into "ability groups" and have parents split up to take the group that they feel comfortable skiing with. In my personal case, I'd happily head out with some of the more beginner skiers, leaving more experienced adults to ski the difficult runs with the older kids. Last weekend we wanted to go off-resort skiing as a family, and we chose a destination with a very steep climb/descent - that we weren't sure our son would be up for on cross country skis. The goal was to ski up to a fire lookout with gorgeous views as a family, and then to enjoy the screamer of a descent down. While we started out outing on cross country skis to access the lookout trail, my husband attached our son's downhill skis to his pack, with his boots inside. We figured it would be a good option if the descent was too steep for skinny cross country skis. As it turned out, the snow was clumpy and warm, our son's skis kept icing up, and he could not make any progress trying to ski up to the lookout on cross country skis. Out came the downhill skis (and a tow rope) and we were off again. My husband towed our son up to the lookout, and then we all had a blast skiing down. Read about another backcountry ski trip we did as a family here (using a combination of snowshoeing and skiing:) Introduction to Family Backcountry Ski Touring. We love skiing at Nakiska for day trips because we can make it to the hill in 45 minutes on a good day, door to door. While we love many of the other resorts in our mountain parks, we don't want to spend three hours of our day driving to get to/from the ski hill. We save the bigger resorts for overnight trips but ski close when it's a Saturday ski day. And I tend to think the kids will thank you for not making them spend 3 hours of their day riding in a car. Not bad for November Skiing close to home! And if you have toddlers or preschoolers, check out these two stories just written by other Calgary outdoor moms. Disclaimer: This story is not sponsored and all opinions are my own. I have chosen to partner with Resorts of the Canadian Rockies for another ski season though, so you will see many references to RCR resorts.